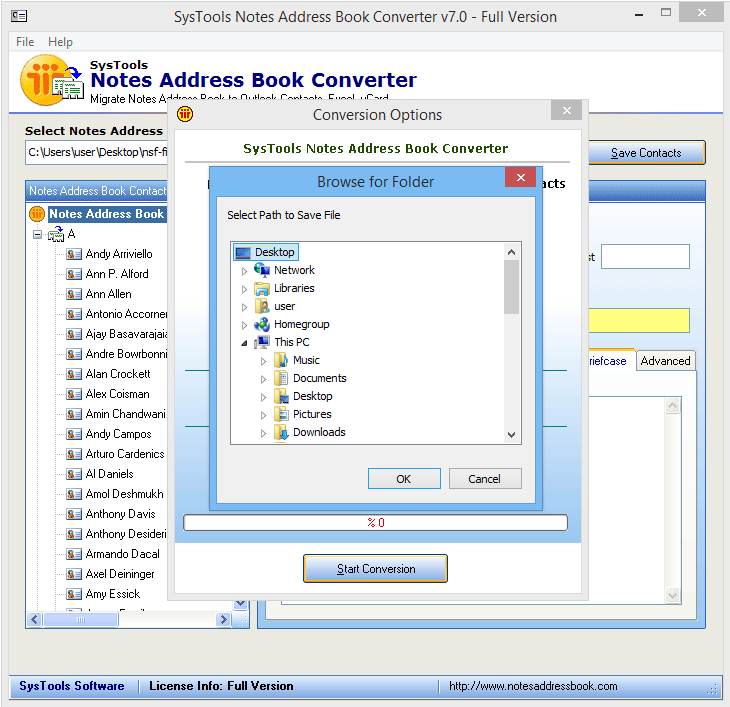 Export address book Lotus Notes to Outlook or other contact storage formats. 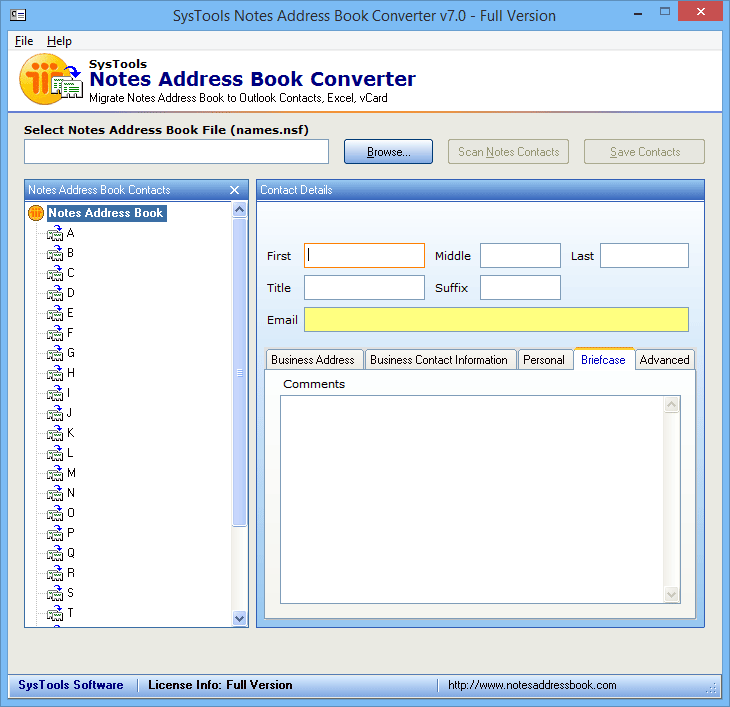 Notes Address Book Converter application is built with a user friendly UI but without compromising on the technological front. Therefore, you can convert Notes contact to various storages. 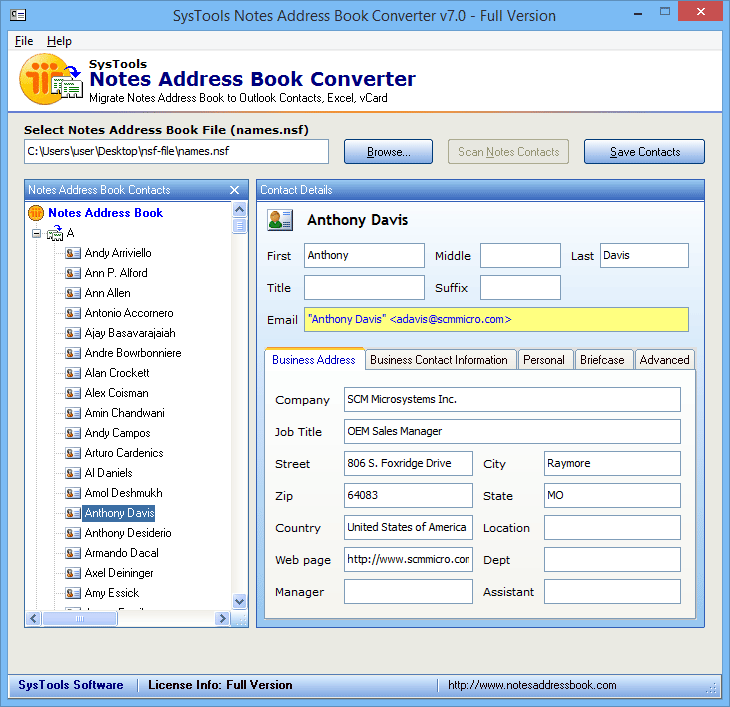 The Lotus Notes Address Book Migrator Software is built to render complete data conversion from IBM Notes contacts file to a number of other featured formats. The data conversion is carried out by the Notes contacts Migrator without interference caused in the contact attributes. You can have a look at the contacts stored within the Notes contacts file before being converted. The arrangement of contacts is automatically done in an alphabetical order as soon as they are scanned for easily sorting and distinguishing the contacts. Multiple contacts conversion is feasible with the help of software. 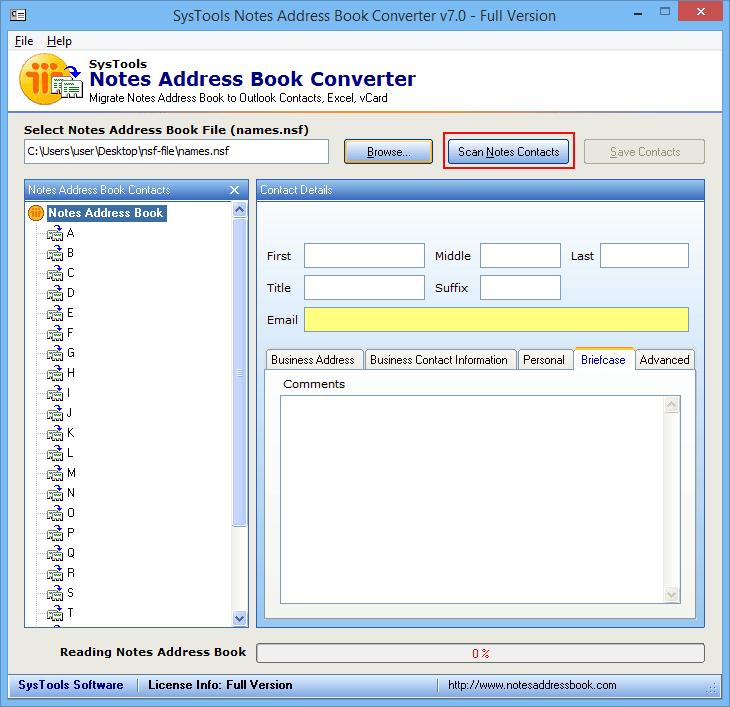 Export Lotus Notes contacts to Excel or other formats. The software imposes no limitation on the number of contacts or size of the NAB file being converted. The best way to transfer Lotus Notes contacts to vCard is via NAB file conversion software. Output generated will be a single vCard file that consisting of all the contacts converted from Notes contacts file collectively. 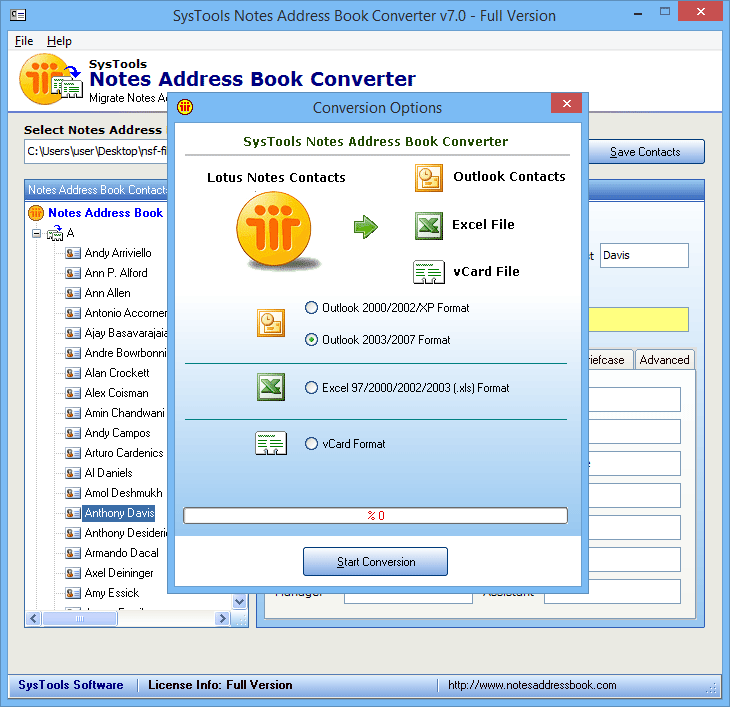 Convert Lotus Notes contacts to Outlook of your preference. Choose from the two conversion options featured for Outlook, i.e. Outlook 2000 - XP format (ANSI PST) or Outlook 2003 - 2007 format (Unicode PST) which is supported on later versions too. 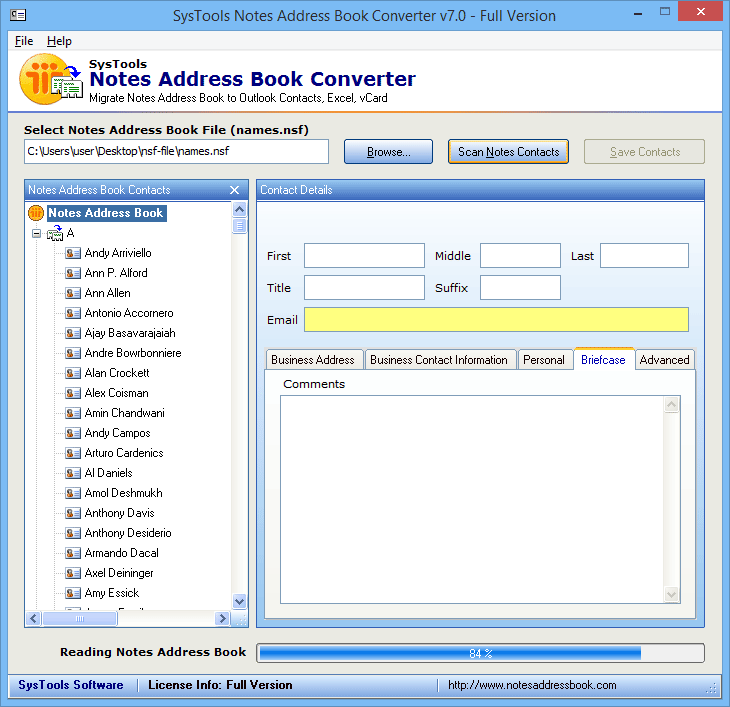 The Address Book Converter Software can migrate Lotus Notes contacts to Excel format. With the help of the software, you can create an XLS file consisting of all the Notes contacts arranged in an alphabetical order with all the respective fields. Q. 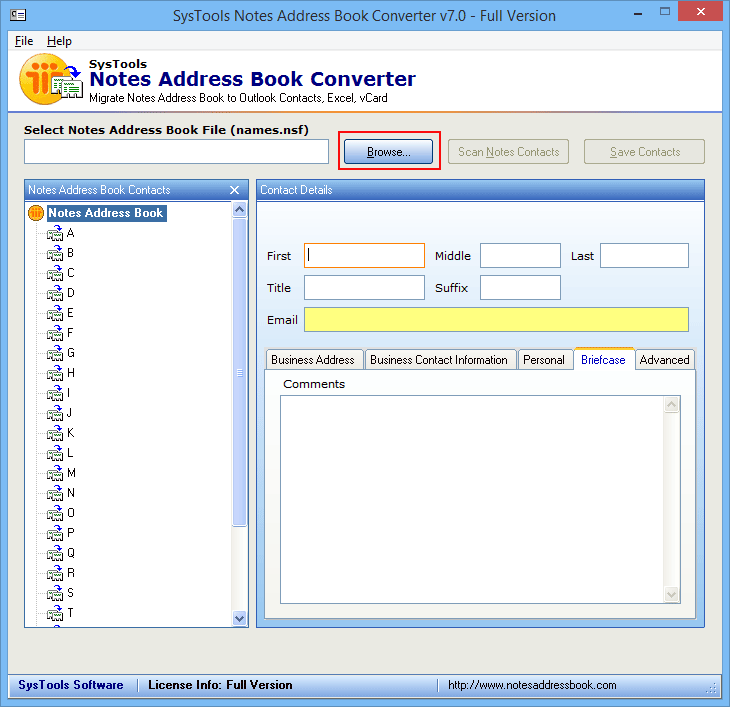 How can I convert Notes address book contacts to my smartphone? Ans: You can convert Lotus Note address to vCard using the NAB Converter application. The software is meant to convert Notes contacts into multiple contact storage formats which includes; vCard as well. Conversion to vCard will enable you to move contacts of your IBM Notes account on smartphones as they support vCard formats. Q. What is the best method to move Lotus Notes contacts to Outlook? Ans: Yes, you can very well migrate the contacts of a Notes account into Outlook address book using NAB Converter. In fact, the software features to convert contacts into ANSI PST for older versions of Outlook and Unicode PST for the latest releases. 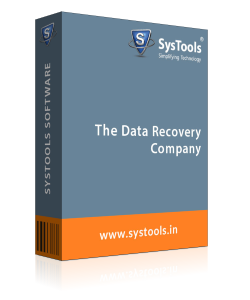 Software maintains full compatibility ratio during the conversion. How to Lotus Notes Contacts Export? Step 1 : Go to Start menu » Programs » Lotus Notes Contacts Export Tool. 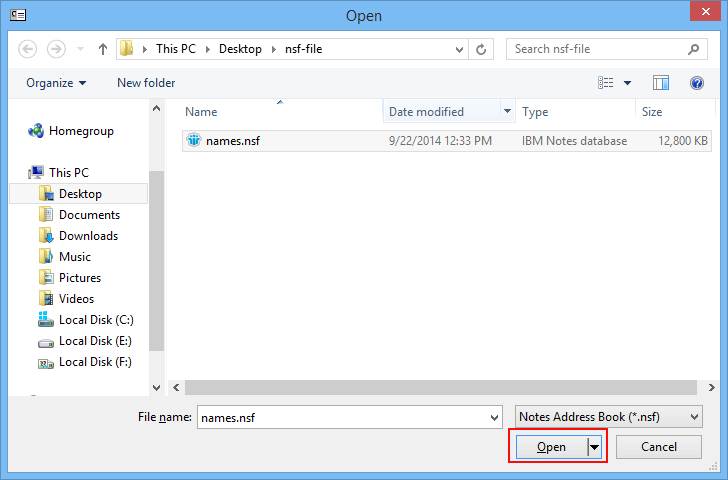 Step 2 : Browse the Lotus Notes contacts file in NSF format you want to Change into Outlook contact. Step 3 : After clicking the Browse, this screen will display. Choose .nsf file and click on the Open option. Step 4 : Now click on the Scan Notes Contacts Option to continue the scanning process. 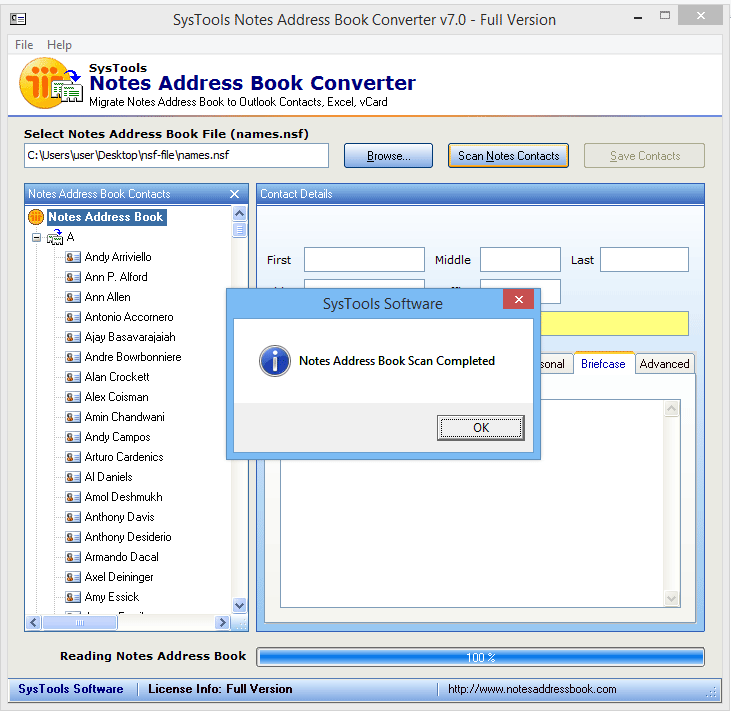 Step 5 : Notes Address Book Migrator will start scanning the selected Notes Address Book file (.nsf file) and allocate you progress update. Step 6 : After complete scanning of Lotus Notes contacts, the Lotus Notes COntacts Export Tool will show the following message: Notes Address Book Scan Completed. Step 7 : After complete scanning of selected .nsf file, software will show all the contacts from the Lotus Notes Address Book file (.nsf), software reposition the contacts in particular folders alphabetically. Choose particular contacts to view their details from names.nsf file. Step 8 : Now click on Save Contacts option to start the saving. Step 9 : The Notes contacts to outlook Convert Software will show all available "Conversion Options". Select required conversion format, you may save contacts into any Outlook PST file, transfer contacts to Excel file, or export them in vCard format. Click on "Start Conversion" option. Step 10 : Now select the area where you want to store the converted contacts. Step 11 : Click on OK Button. The lotus Notes Contact Migrate Software will start changing Lotus Notes contacts file to the selected format. 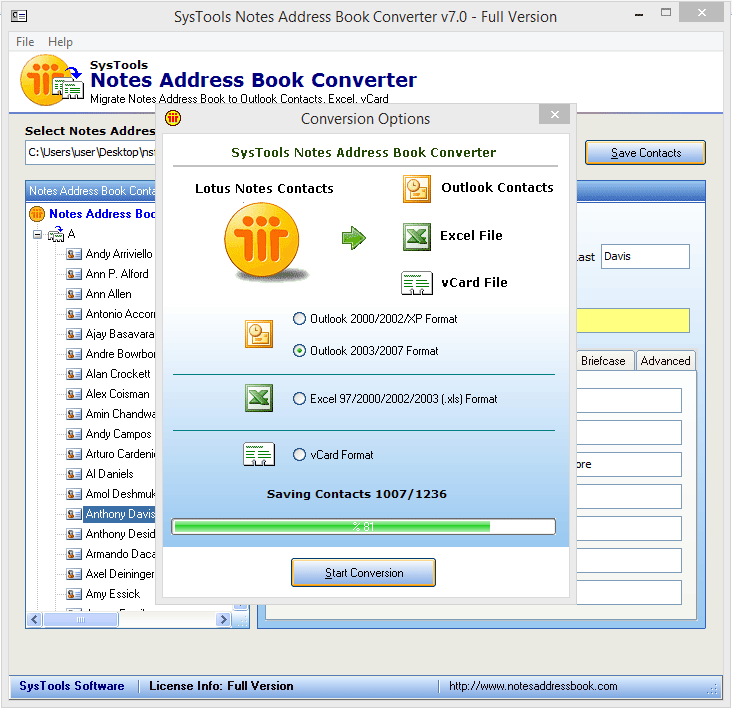 Step 12 : After converting Lotus Notes Address Book file (NSF file), The NSF Contacts to vCard Converter Software will show the number of contacts successfully Migrated.